It’s been a few years since I built this bed, but since I’ve started blogging I decided to share some projects that are already completed. This was a big one for me. We decided after having our second child that we needed a King size bed. Our daughter was coming in bed with us almost every night, and we needed more space. 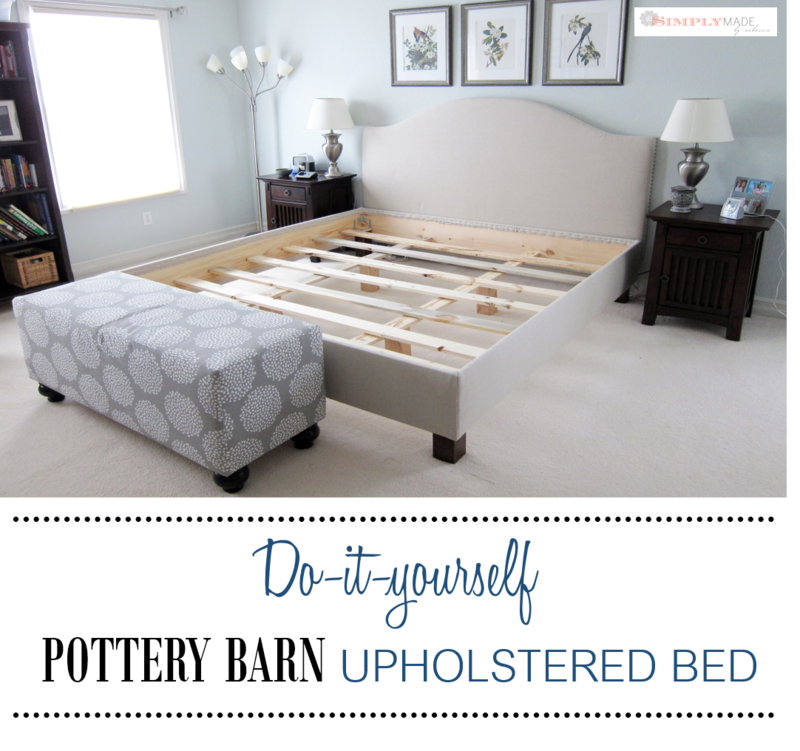 I really liked the look of the Raleigh Upholstered bed from Pottery Barn, but, as I do with most items, I looked at it and thought “I can make that”. I purchased the material from Pottery Barn for approximately $30 a yard. I’ve since found an identical fabric at Joann’s on clearance for $8 a yard. I bought everything they had and I’m storing it away for a project someday. I freehanded the profile for the headboard out of a 4′ x 8′ piece of 1/2″ birch plywood. The plywood was cut down to 4′ x 78″. 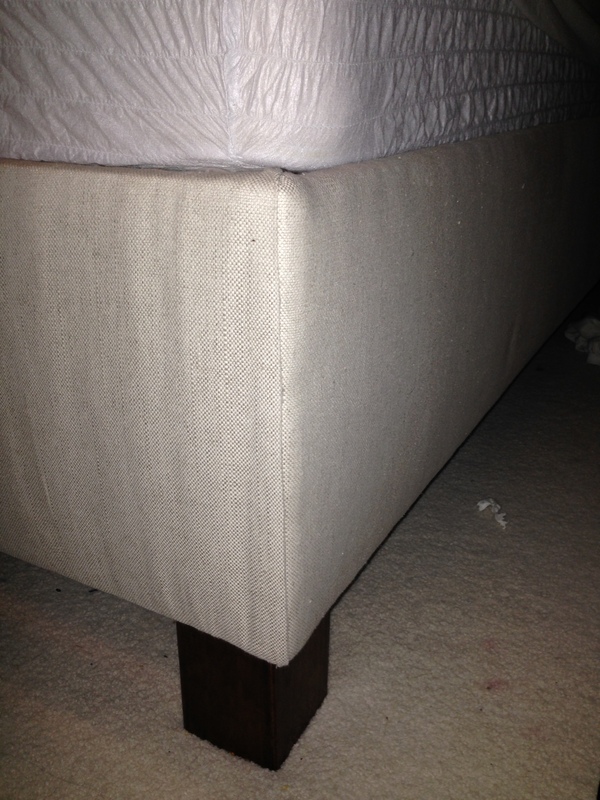 The size of a king mattress is 76″ x 80″, so I added 1/2″ for clearance and 1.5″ for the 3/4″ boards. I started in the middle of the plywood and drew the profile for a “Eccleston” headboard. 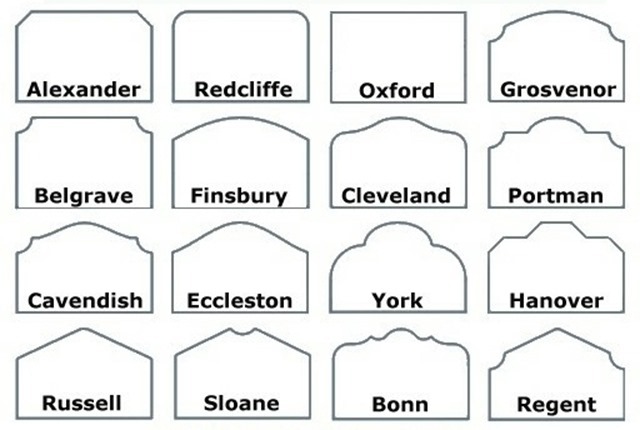 Below is a picture I found from allthingsthrifty.com with the names of the different headboard profiles. I cut out one side with a jigsaw, and then used the piece that was cut out to draw the same profile on the other side of the plywood so they matched perfectly. Any sharp or raised edges were knocked off using a rotary sander with a 220 grit sanding pad. I laid the board on the foam and drew the profile onto the foam and then cut it out with scissors. I found that sharp scissors worked better than a knife. Two 24″ pieces of foam were used to cover the board (a cheaper options than buying a 4′ piece of foam). To staple the batting to the plywood, I laid the batting on the ground, the foam on top, and then lined up the plywood over the foam. We have a Porter-Cable pneumatic upholstery stapler that I used to staple this project. I love it. I have a hard time getting the staples completely into the board with a manual staple gun, so for me this is a great little tool to have on hand. After the batting was stapled, I laid it on the fabric and started stapling. First, I always put in one staple on all four sides to keep the orientation of the fabric correct. Then I stapled the top first because I knew it was going to be more difficult. The key to getting good-looking upholstered projects is to pull the fabric when you staple. To achieve the look of the Pottery Barn bed, I bought upholstery tacks in an antique bronze finish and hammered these in to the 1/2″ plywood. I used smaller tacks, but I still like the look. 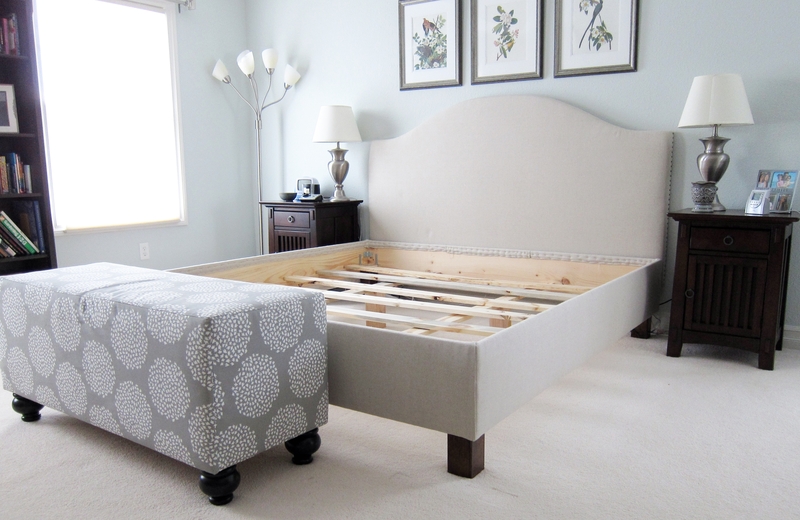 To build the bed I used 1″ x 12″ boards (the actual dimensions of the board are 3/4″ x 11.5″) to make the sides of the bed, and 4×4″ posts cut to 9.5″ for the legs. 8 legs were cut, four for the corners of the bed, and four under the extra supports. I wish I would have made the legs 1-1.5″ longer. I was hoping to be able to fit plastic containers under the bed, but it’s just a bit too short. Two 1″ x 12″ boards were cut at 76.5″ and two were cut at 82″ (these dimensions are both accounting for the 3/4″ thickness of the boards). I glued the edges of the boards and used the Kreg Pockethole Jig to screw these pieces together. 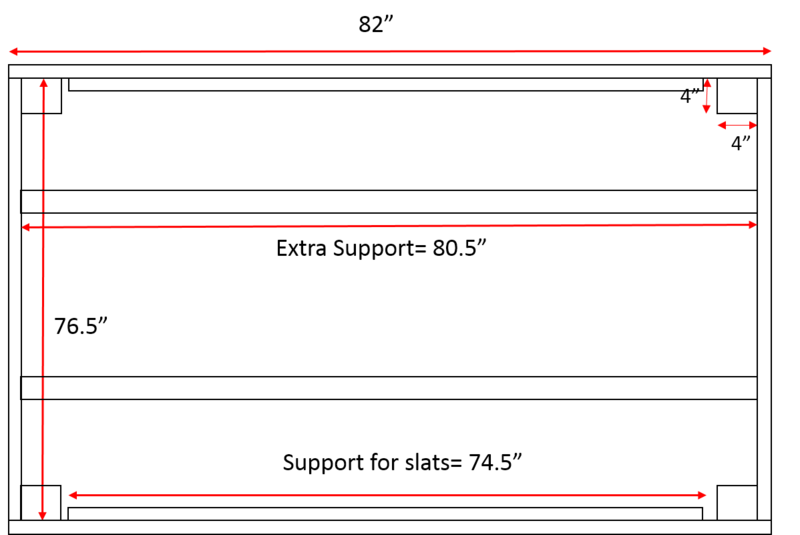 A diagram for the assembly of the boards is below. I screwed 1″ x 2″ x 74.5″ trim pieces into the frame 6.5″ from the top. We used this board to support and screw the slats into. Two 1″ x 4″ x 80.5″ boards were used for extra support. They were also screwed in 6.5″ from the top. 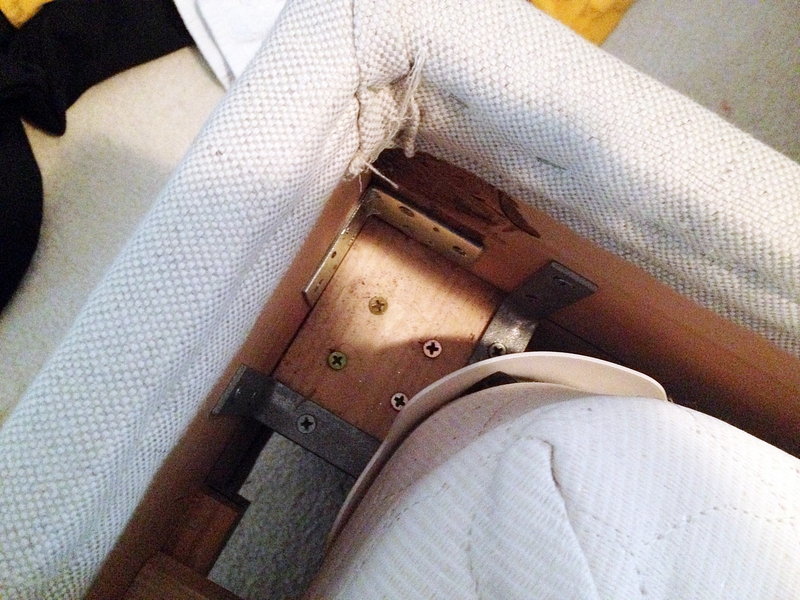 In the inside corners a piece of 1″ board cut at 4″ x 4″ was screwed using pockethole screws to the bed frame. This was placed 6.5″ from the top. This was used to screw the legs into and to reinforce the edges a bit. We also went further and put brackets attaching the boards together and attaching the 4″ x 4″ boards to the frame. This is pictured below. 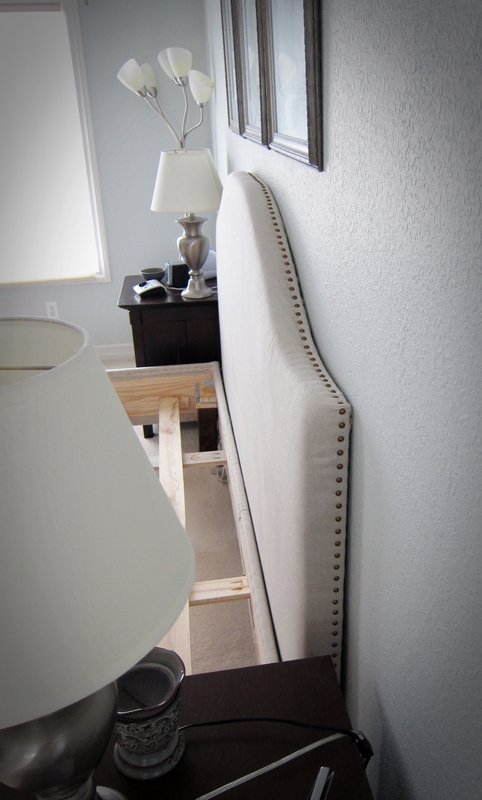 I would recommend building all of the bed frame before upholstering. I did not do it this way, and it was hard to get the leg in the corner because of the bulkiness from the fabric. Lastly, screw the 9.5″ stained leg that was cut from 4″ x 4″ posts to the corner boards. Now, for the upholstery I used my pneumatic staple gun again to first attach batting, and then the fabric. I folded the fabric over at the corners and put some hot glue to hold it. You could also use fabric glue. This is pictured below. You’ll need to work the fabric around the leg, but this can me done by folding the edge around, and stapling it tight on either side of the leg. It will be a bit tricky because it’s folded, which is why I originally upholstered first and then added the leg, but this posed problems also. If you upholster first before attaching the legs, be mindful that you don’t bunch up the fabric when stapling in the corners. Screw in your slats, which should be cut at 76.5″ and you’re ready to place a box spring and mattress on. I believe I used 1″ x 4″ boards for the slats. Of course, if you make this bed for yourself, please check all the measurements. For starters, the dimensions of your mattress may be different than mine. Here’s one more pic of the final product. I also made the bench at the end of the bed, which was a West Elm knock-off. That will be in a future post:). Can you give me the total cost for this bed?